Update: The following video — shot during Day 2 of the Middletown, OH Pickleball Tournament — will give you a flavor of the excitement, competitiveness and camaraderie of pickleball in southwest, Ohio. In just over a week (August 2-4), 217 players from several states will be descending upon Middletown, Ohio, for its annual Pickleball Tournament at Lefferson Park (2201 S Breiel Blvd, Middletown, OH 45044). This tournament is currently one of the two largest pickleball tournaments in the state of Ohio. I will once again be the “head referee” for the event. If you’re able to come out and watch on any of the days, please make a point of finding us at our PickleballMAX booth set up along “vendor row.” Hope to see you there! 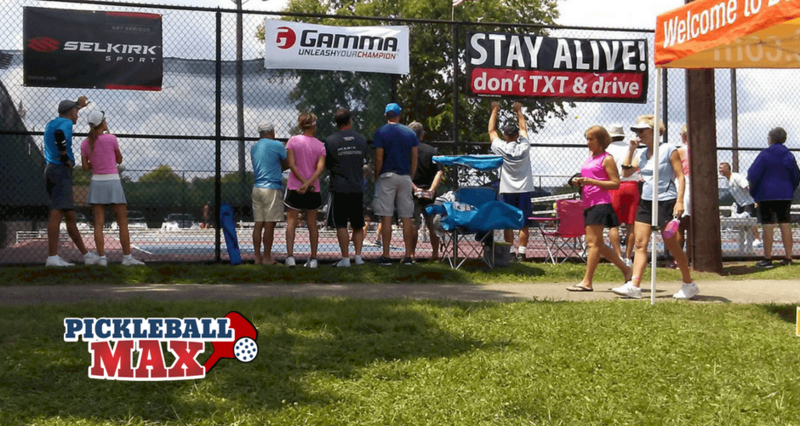 Whether you’re a current pickleball addict — or, perhaps, have never previously played pickleball — I strongly encourage you to check out the action on any of the three days. You will undoubtedly see participants enjoying the competition and having a great time – as well as getting some really good exercise in the process! Perhaps it will even jump-start a few ideas on how you can leverage pickleball as part of your organization’s own employee wellness program. Still on the fence about coming out to watch? Click here for a recap from the event from just two years ago. Hope to see you there. See you on the courts! Start the New Year with a Pickleball Planner! Product Recommendations for the Pickleball Addict! For additional product recommendations for the pickleball addict, please check out Product Recommendations for the Pickleball Addict.